A Woof Wear Poultice Hoof Boot. The Woof Wear Medical Hoof Boot Is Ideal For Keeping Poultices / Bandages In Place and Helps Bring a Quick Recovery Back to Your Horse or Pony! A unique close fitting hoof boot designed to keep wounds, poultices and dressings clean. 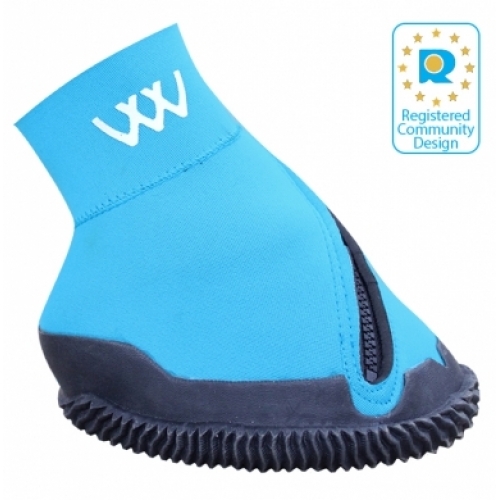 This boot is suitable for use in the stable and can be used on sensible horses in a non muddy paddock. The boot is designed using flexible and light materials to enable easy fitting and as a cost effective alternative to adhesive bandage and tape. Bearing this in mind exuberant horses and those having undertaken a period of box rest may damage the boot by standing on it or doing racing stops. In these situations you may wish to consider placing an overreach boot on top of the medical hoof boot or using a more traditional poultice for the first day turned out. The Woof Wear poultice boot is NOT to be used in muddy / wet turnout conditions. Woof Wear expect the boot to last 2 - 3 weeks under normal circumstances with many customers finding they last much longer. The boot is not indestructible and so is not guaranteed against breakage, due to the horse standing on the boot. Can be used for well drained turnout (no mud) and Woof Wear always advise to use an overreach boot on top of the poultice hoof boot if using it for turnout. Kevlar reinforced sole and neoprene upper with an easy zip. The boot zips open right up to allow easy access for the hoof. This boot is not indestructable and the product is NOT guaranteed against breakage due to the horse standing on the boot. Available in Sizes - Please See Size Chart Below. Suitable for: Most leg or hoof conditions. The Woof Wear Poultice Hoof Boot is just the prescription for horses requiring a therapy boot that offers stability and support without being heavy or clunky. The Woof Wear Poultice Hoof Boot helps horses to heal and recover quickly, and is used by Vets, hoof care professionals and horse owners to offer support and relief for horses suffering from problems including chronic lameness, laminitis, founder, navicular and other lower limb / hoof problems. The Woof Wear Poultice Hoof Boot is the ideal option for horses that simply have trouble standing on hard surfaces for extended periods for time. The Woof Wear Poultice Hoof Boot can also be used to speed recovery and offer protection after surgery or injury as well as to lessen fatigue and add protection during travelling or breeding.